My desire to write and start a blog which I titled it as RandomThoughts! was a challenge of my writing skills when Negros Bloggers President H. James Toga added me to Negros Bloggers closed group in Facebook, wherein good writers, good bloggers chatted regularly, especially at night. Every time I opened my computer to browse the Internet I directly signed in to my Facebook account and visited Negros Bloggers Page. There I saw several links of their blogs, which out of my curiosity, I read them all. Until I became acquainted with the members of NB and befriended with them. And I sensed my belongingness with this group which is composed of students, government employees, freelance writers, businessmen, realtors, legal luminaries, news reporters. They were the pioneers of NB as the core group. As I regularly followed up their blogs, I said to myself, "This is a challenge of my writing prowess to start a blog of my own. But of course not to compete with them for they'd different fields of expertise and mine is different too. Therefore, doing what I could muster to start a blog is the answer. I started with a unique title, with a controlled contents of various topics which I believe could get the interest of my readers. So RandomThoughts! (as opposed to non-random thoughts) came to being 3 February 2011. I blogged about beliefs, family, education, news of general interest, lifestyles, among others. 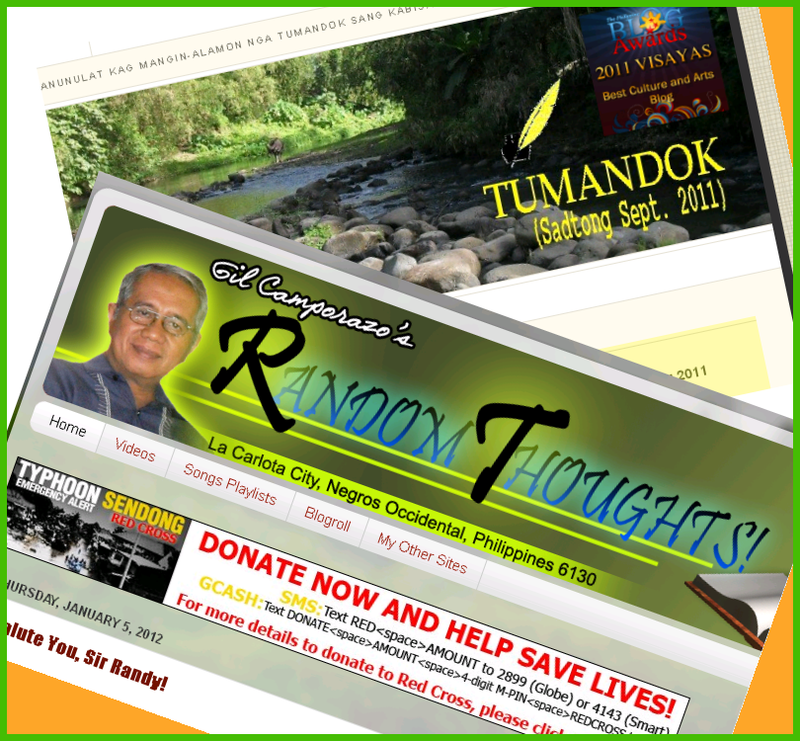 To make my blog readable, I've to promote it to my circle of friends about it. I also submitted it to some noted search engines for free indexing. For four months I kept on blogging. The rate of my readership increased in leaps and bounds. I never had an idea that there is the Philippine Blog Awards which is giving due recognition to those well-deserving Filipino bloggers. Nevertheless I did blog regularly to express my thoughts that came along the way. Until I came across with one of the NB members announcing the very deadline of submitting one's blog entry to the annual PBA rites. Curiosity struck me. I wanted to join the search for best blog in various categories just for a try. However, I was taken aback for it's unethical for myself to submit my own entry. Not until one member of NB posted in FB that she had already nominated her blog to the said giving-award site. That prompted me to nominate my two blogs: Randomthoughts and Tumandok, three days before the September 30, 2011 deadline. Beyond my expectation, RandomThoughts! was named as the "Best Blog in Lifestyle" category, and Tumandok, a repository of Hiligaynon dialect works of Western Visayas natives, which was created in 17 September 2011, was awarded as the "Best Blog in Culture and Arts." I received the two awards in a row on 12 November 2011 at Silay City Historical Museum, Negros Occidental, Philippines from PBA President Juned Sonido. I attributed these prestigious awards that I received to writing a quality write-ups, making it informative, educative and entertaining, and also a well attributed sources, clean and simple blog format, and well-read, most-visited site. And of course, to the One who gives me this talent of writing, the Lord God Almighty. For me blogging was the greatest influence by a virtual friend. Someone who gives me an idea and simply appreciate my skills that I can do this things. You know I am inspired of your writing skills and always be your fan. My blogging started with some encouragement from blogger friends, one of which bought a domain for me and the rest is history. Though I may not have garnered awards (yet...hehehe...hoping?) but since I have this love for writing, I write...even though I know my skill in writing is not that exceptional. This is inspiring! for me since I love Technology I guess blogging is just way for me to share things i really like on Tech. I am inspired of your writing skills and now i know how you started blogging. My blogging started when I wanted to share something to everyone and found out that i can write about it in the form of blog. Blogging is a therapy for me, which is weird 'cause I already write for a living. Siguro kasi sa blogging, I write about the things I love. it is good to know you have found a very good outlet to share your thoughts and writings. congratulations for being recognized in the philippine blogging scene. :) all the best. you've got right here on this post. I'll be copming back to your website for more soon.